No matter the price of your instruments and the skillyou possess, the sounds you create still might not sound as good as you’d like.It could be simply due to a bad drum mic. There are many reasons that you should purchase a good overhead drum mic. In this guide, we have a list of some of the things you should be looking for when you purchase your mic and some tips for an easy setup. This overhead mic is great for drums, symbols, acoustics, and indoor use, all while being durable and heavy duty. You’d love the satin nickel finish too. Great for choirs, acoustics, or studio recording, while maintaining a sleek and modern matte black finish. Great for studio recording and live performances. Easily portable due to the included carrying case and mic clips, the C02 is great for situations where multiple mic placements are required. You’d love the low-mass capsule which captures a narrow pick-up area. While being sturdy and durable, this mic gives you a cost-effective way to produce high-quality sound. Fans of this microphone love its warm and natural tones. This mic is versatile and can be used in many different settings with many different types of instruments. Designed for studio settings but good enough for live sessions too. Rode Microphones come from a company based in Sydney, Australia. Each and every detail is taken into account while creating these overhead drum mics, as they have a set of highly skilled team members across many disciplines creating them. Some of the disciplines that contributes to their design are acoustic engineering, electronic engineering, technical engineering, industrial design, quality control, and more. This ensures you are getting the finest product. This overhead drum microphone is a cardioid condenser that has been finished in durable satin nickel, making it heavy duty and good for extended use without becoming damaged. Its uses include drum overheads, cymbals, acoustic instruments and live performances due to the externally polarized mic. While being compact, it also uses a half inch capsule and an active J-Fet impedance converter. These have a bipolar output buffer.Along with all of its other uses, it is also great for indoor use due to the tight cardioid pickup pattern. Use it for dialogue or film making on a mic stand or boom. This award-winning overhead drum microphone is designed and produced by many expert teams with years of experience from Sydney, Australia. Its half-inch cardioid condenser microphone offers full frequency response and low noise. This makes it great for using live on stage or studio recording. You’d love how it works wonders when used for choirs, acoustic instruments, or any application for small diaphragm condenser microphones. Use the Rose M5-MP either individually or as a stereo array.There is a variation of no more than 1dB sensitivity between the microphones due to careful selection of the matched pair. This overhead drum mic stands out from others because of its sleek matte black finish. It is made from a durable ceramic coating that gives it a modern and streamlined look. It is also supplied with WS5 windshields and RM5 stand mounts. The Samson C02 Condenser Microphone has an affordable package price while still being a high-quality product. It is sold as a stereo pair, which is important because using multiple mics ensures quality captured audio due to the increased detail of your recordings. Need multiple mic placements? This Samson Microphone has you covered.It can cater to multiple placements and this includes percussion instruments such as overheads and cymbals, as well as stringed instruments like violin and guitar. This mic also features a low-mass capsule with a cardioid polar pattern, which captures a narrow pick-up area directly in front of the microphone. This results in a minimized ambient room noise and signals from other potential monitors and instruments that could otherwise cause feedback. Along with all of the other perks, this mic also has a convenient carrying case and a set of shock-mounted mic clips included. This ensures a portable mic that is easy to transfer. 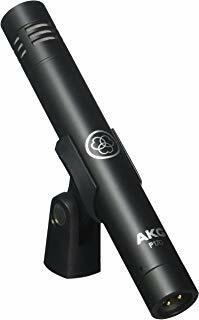 If you are looking for an overhead drum mic that holds a professional and high-quality sound, then the AKG will be a good fit for you. This mic has a warm and natural sound to it. This makes it perfect to use for stereo recordings of any acoustic instrument either on the stage or in the studio. This mic makes it possible to get a high-quality sound in a cost-effective way. The C214 large-diaphragm condenser microphone was designed to be a cheaper alternative to the high-end C414 family, while still creating the great performance that the C414 has. It does this by capturing the sound and combining one capsule of the legendary C414 dual-capsule system and the patented AKG Back-Plate technology.On top of all of that, an aluminum carrying case is included and the mic itself is very sturdy. This makes it durable while being transported and on stage. This mic was designed for studio use, yet created in a way that makes it durable enough for live stage application. This makes it precise and versatile. It has uses ranging from recording wind, strings, and percussion, all the way to piano and guitar. This mic is made with an ultra-thin 24 karat gold-layered low mass Myler diaphragm. This gives it a good transient response. This means that it will have no crossover distortion, intermodal distortion, and minimal harmonics. It is best used for recording musical instruments due to its low frequency filter and extended frequency response. It can also withstand levels of high sound pressure. Use this Shure microphone with acoustic instruments, electric guitar amplifiers, brass and woodwinds, orchestras and choirs, room ambiance pick-up, and some low-frequency instruments. You can have the highest quality instruments on the market, but if your overhead drum mics do not match that quality, you will still not get a great sound. With all of the potential mics on the market, it can be hard to pick one. Here is what you should look for when purchasing your overhead drum mic. Depending on your uses for the mic, this can be different for everyone. A larger diaphragm is good if you need more sound detail. But it’s good to know that a smaller one will work just fine for other recordings. One tip is to get a high-quality mic that is able to record different types of sounds and instruments. It will cost more money up front, but it is better than getting a mic that is only good for a specific type of sound. This way you will not need to purchase another mics. This is recommended because having a matched pair gives you the chance to obtain the most sound from your instruments. Along with that, these will be produced together so they will easily work in singularity for better recordings. Having unmatched microphones also has the chance of causing discrepancies in the sound. This becomes the most noticeable when the mic is closer to what you are recording. Once you have chosen the right overhead drum microphone that fits your style and needs, you will need to know how to set it up. What you are going to need to remember is that recording drums are not an exact science. Each session is going to be different based on your microphone, drums, studio room, and so on. All of these cause variations. There are several techniques that will help. For this, you are going to use cardioid condenser mics and arrange them with the elements as close together as you can. But make sure you keep that at a 90-degree angle. This offers a phase-coherent stereo image. We recommend placing your mics directly above the snare to keep it centered on the stereo field. Make sure to keep them high enough above the cymbals so that they never pass through the element physically. Position a pair of cardioid condenser mics 17 cm apart and angle them 110 degrees from each other. This offers a coherent stereo image with more width and cymbals compared to the rest of the drum kit than the X-Y configuration. You can gain great flexibility in placement by spacing your pair of condensers. Make sure to place the mics above the cymbals If you want to remove emphasis from other parts of the kit. If you require a more balanced sound, then you can place them at a higher elevation. Your stereo image will be wider based on the distance you position the microphones. Remember, you can widen the gap between your microphone by widening your image and, vise-versa, narrow it by bringing them together. If you follow these tips, you’ll never have to sacrifice your music’s quality due to a bad mic. There are countless overhead drum mics, so choosing just one could be difficult. But now that you know what to look for, choosing should be a breeze. This list gives you a great place to start for some of the best overhead drum mic options. Setup will be a breeze and you can begin making a great sound in no time.